Bill Mitchell, Head Greenkeeper at Perranporth Golf Club in Cornwall and Adrian Kay, Head Groundsman at York Racecourse have been crowned Terrain Aeration's Unsung Heroes of 2008/9. Bill, nominated by Richard Whyman Course Manager at Burnham and Berrow Golf Club, has been in greenkeeping for over 45 years and led Perranporth to be recognised as a true links course and a benchmark for clubs in the area. Passionate about greenkeeper education, he was involved at the start, helping Dutchy College to assess trainees, giving his time and travelling expenses free of charge and often providing reference books paid for out of his own pocket. Adrian, nominated by Stephen Fell of Lindum Turf has struggled valiantly throughout 2008 to keep the facility open despite appalling weather, a major re-vamp of the course and an extensive programme of re-drainage. Speaking on behalf of his fellow judges, Derek Walder of the IOG and Billy McMillan of BIGGA, the STRI's Steve Gingell said that in the run-up to the Ebor four day race meeting, Adrian had been working from 3.00am to get water off the course. "In the event the meeting had to be cancelled, but despite the course's situation on the York flood plain all other race meetings had gone ahead due to Adrian's efforts," he concluded. 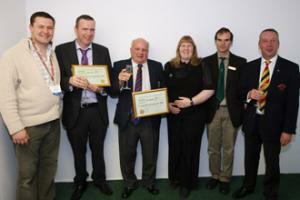 During the annual awards, which took place at BTME the winners received holiday vouchers and framed certificates from Terrain Aeration and cheques for £200 each presented by sponsors Pitchcare and The English Golf Union. Pictured left to right - Dave Saltman (Pitchcare), Adrian Kay, Bill Mitchell, Lynda Green (Terrain Aeration), Steve Gingell (STRI) and Paul Keeling (EGU).